Food lovers have obvious problems with diets. Perhaps the most common belief food lovers have about diets is that you must curtail intake of your beloved, precious food. This may generally be true, but by choosing the right kinds of foods, you can satisfy your hunger, please your inner epicurean, and still lose weight - so beef up your diet with foods that reduce fat or burn fat cells. Certain foods can enhance the breakdown of fat, or enhance fat-burning by boosting your metabolism. The consumption and digestion process consumes calories. Muscles that line your stomach work hard to grind and pulverize the food you eat, and even the process of chewing consumes calories. Consequently, there are some foods that burn more calories than they contain. Weight watchers and dieters have long appreciated salads. 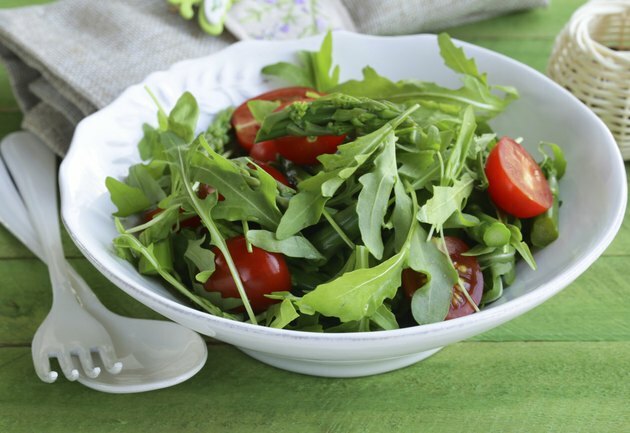 Salads contain greens such as lettuce, spinach, escarole, mustard, chard, endive, cress and kale. Blessed with varying flavors, these greens range from mild to zesty, but barely contain any calories. For example, 1 cup of iceberg lettuce contains only six calories. Greens like spinach and kale are loaded with nutrition, but all greens have fiber that clean out the intestines and aid digestion. Throw in fresh herbs like rosemary, oregano, basil, cilantro, chives and parsley to spike the flavor. Heighten the crunch factor while adding negligible calories by mixing in celery. Toss in red, orange, yellow and green peppers. These vegetables add just a few calories—for example, a quarter of a large green pepper will add just nine calories to your creation—but also provide vitamin C, lycopene and phytonutrients. At seven calories, a quarter cup of cherry tomatoes gives you vitamins A, B6 and C, along with other nutrients and a delicious pop in your mouth. Don’t hold back now. For the denouement, top your work of food-art with almonds. Almonds add protein, fiber, and healthy fat, curbing your appetite and stabilizing blood sugar. People who eat 1 to 3 ounces of almonds a day lose weight and have less belly fat, according to FoxNews.com. The caffeine in green tea is said to boost metabolism while inhibiting appetite, meaning that you burn more calories and eat less food. An experiment published in Physiological Behavior found that subjects who drank 2 or 3 cups of green tea daily lost more weight than subjects who had an identical diet but did not drink tea. The tea drinkers were shown to have an increased metabolism compared to the non-tea drinkers. The muscle-building protein contained in lean meats like turkey, chicken and sirloin steak takes a long time to digest, stabilizes your blood sugar and burns calories in the digestion process. Eaten in moderation, and balanced with a rigorous exercise routine, protein rich foods enhance muscle development. The more muscle people have, the more calories they burn, even when sitting or reclining, according to FoxNews.com. Low fat yogurt, skim milk and other dairy products like cheese contain lots of calcium and protein. Protein stabilizes blood sugar and reduces your appetite and calcium not only regulates digestion, but also increases the breakdown of fat in cells, according to Fat Free Diet. The pectin found in apple limits the amount of fat absorbed by cells. According to WSBTV, the antioxidants in apples may lower the risk for metabolic syndrome, a condition where the waist thickens creating what is sometimes referred to as an apple-shape. So, ironically, apples may help prevent apple-shape. Citrus fruit such as grapefruit, tangerines, papaya, lime and tomatoes are rich in vitamin C, which participates in the fat burning process. Vitamin C also stimulates carnitine. This amino acid enhances the body’s capacity to burn fat. Loaded with fiber, the digestion of these fruit requires the expenditure of calories.